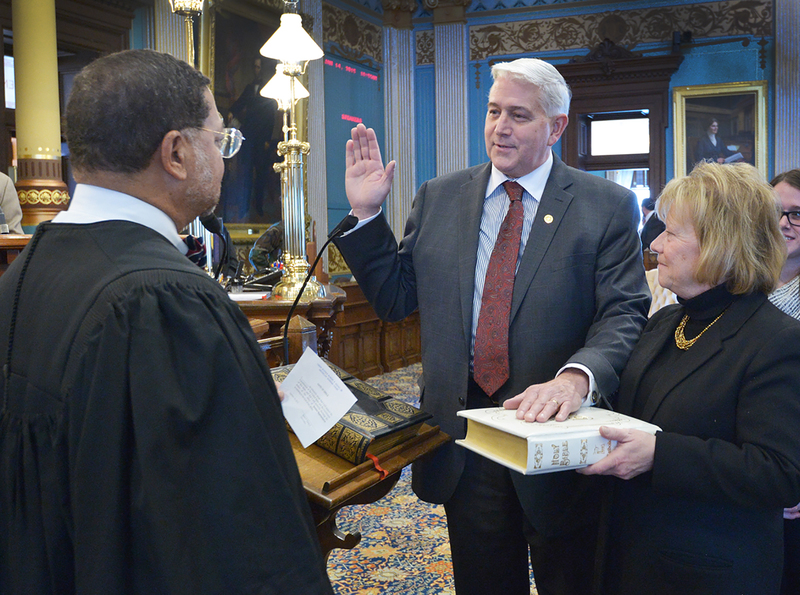 LANSING—State Sen. Ken Horn, R-Frankenmuth, participated in a swearing-in ceremony Wednesday at the state Capitol with Michigan Supreme Court Chief Justice Robert P. Young, Jr. administering the oath of office. Horn was joined on the Senate floor by his wife, Veronica, daughter, Andrea, son, Kevin, daughter-in-law, Ruth and grandson, Liam. LEFT PHOTO DESCRIPTION: Sen. Ken Horn, R-Frankenmuth, is joined by his wife, Veronica, as he is sworn in for his first term as senator for the 32nd District. RIGHT PHOTO DESCRIPTION: Chief Justice Robert P. Young, Jr. (left) stands with Horn (right) and family after Horn was sworn in as senator for the 32nd District.